Student Award honoring one student leader at each member school. Jones is one of 21 students chosen by their campus for the 2015 honor, joining more than 200 college students recognized by the network since the award was first presented in 2006. 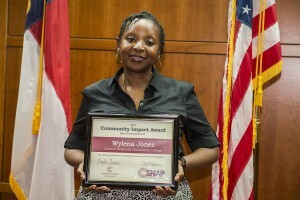 At CPCC, Jones has consistently demonstrated a commitment to service, leadership, and helping others. She has logged more than 90 hours volunteering on projects like the Salvation Army Christmas Center, delivering meals to seniors through Friendship Trays, and supporting fundraisers like the CPCC Skyline Run and the Sensoria Book Sale. A second-year nursing student from Charlotte, Jones is also president of the Phi Theta Kappa honors society and an active member of Rotoract and Positive Communities for Women. She was selected for school’s Ruth Shaw Scholars program, which supports women leaders, and she was a key supporter of the school’s Project Life bone marrow donation drive. This entry was posted in Community and tagged community impact student award, NC Campus Compact, Wylena Jones by Mallory Benz. Bookmark the permalink.